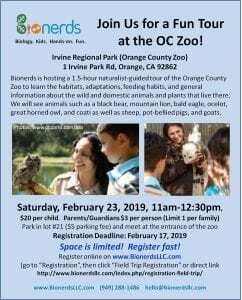 Note: Registration deadline for OC Zoo Field Trip on February 23, 2019 is extended to Thursday 2/21 noon. Register soon! Thank you. Use the form below only for Field Trip Registration. For Class (non-Field Trip) Registration, please click here to go to the specific registration form. Please review our Schedules prior to registration. Download the Field Trip Flyers below. Welcome to our Registration page. We look forward to having fun with your kid! Please review our policy documents below before you register. Don’t worry, our page is secure.